Another trip report? I stopped by the park yesterday to try and get some photos of the bank vault door (they’re at the end of the report) and I took a few other photos as well. You may recall my digital camera died a couple weeks back, so please do not adjust your monitor, these are taken from my 10 year old digital camera. The “What will you celebrate” promotion seems to be quite popular; the ticket booth lines are at least 5 times longer than this same period last year. The Mickey planter looks silly, I guess he’s “celebrating”? Sorry I ate half of my “Seasonal” muffin before the photo. It was Apple & Cinnamon and was yummy. I’m sure this sign has been there for a while but I never noticed it. Look what I found inside the Plaza Pavilion. 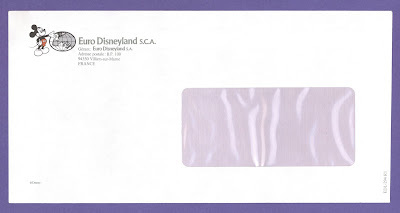 The new Annual Pass Center! Hey look who’s in the reflection in the glass. In this slightly better photo you can see they have a Mr. Lincoln attraction poster framed on the wall; (a) Nice Touch and (b) does this mean we get our Great Moments back with Mr. Lincoln?Also on the wall, next to the Mr. Lincoln poster is a Vintage Park Map, nice touch again! Pretty colors at the hub. Three fences is doing just fine. Please Disneyland, never remove this spot, I’ve grown quite fond of it. The mighty Matterhorn was water-less and guest-less. Closed for “Seasonal” improvements. I’ve read they are installing new seatbelts (Indiana Jones type) that should shorten the load times. There was no trace of them on the bobsleds that were parked out front. These are hard economic times we all know, but spackle and paste won’t fix this!!! Monstro seems to be turning baby blue? Also, check out his teeth, the dude has caps! 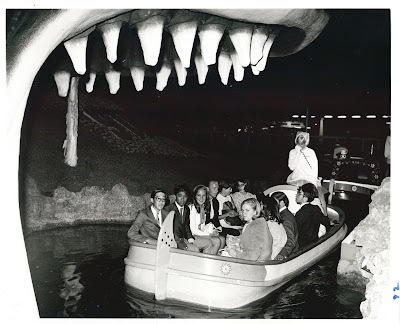 In this June 21, 1969 press photo you can see Monstro’s real teeth. Just like a Hollywood star, Monstro has had “work done” on his appearance. Pardon the blurry photo but I did notice a themed pay phone as a shout out to my friend over at Meet the World. A so-so picture of the River's of America and the Mark Twain, but check out the ducks, they are both just about to land. The ducks reminded me of the emergency duck landing from the Mission to Mars preshow. I miss that corny attraction. The doors to the Veranda Café where I get my Beef Gumbo bread bowl. Why are there bars on the upper windows, they are on the upper windows in the front of Pirates of the Caribbean too, but they are no where else in New Orleans Square? Look who I found in Bear Country! He was more than happy to have me take his photo, I even shook his hand, I mean paw. Just when you thought the ugliest thing you’ve ever seen was the “celebrate” decorations on the lamp posts (link) this comes along. Ugh. Following up on Daveland’s magnificent post about Walt’s apartment, complete with bathroom photo (link), here are the pipes for said bathroom. And now, for the Vault Door. These are the best photos I can get. The lighting is bad, my old camera is, well, old and I obviously don’t know what I’m doing! Looks like they do use the inside, at least for storage. I asked if I could see the “front” of the vault door. They told me they aren’t supposed to move the door. I bet it still works and they’re worried it might get locked. I was told the Bank will remain the AP center until this summer. 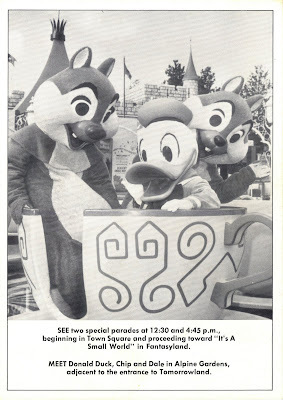 It’s Donald Duck Days at Disneyland, February 27 and 28, 1971. 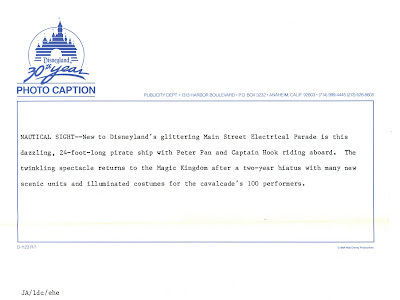 “SEE two special parades at 12:30 and 4:45 p.m.” I hope it wasn’t the same parade twice! 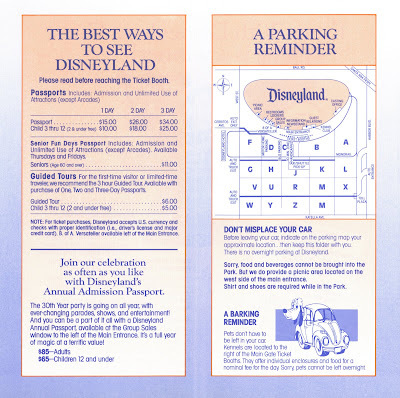 The back has a great game, the “Donald Duck Odd-yssey Game” The object was to earn souvenir decals from the five magical realms of Disneyland. Lucky for us we've got all five stickers so water will now roll off our backs. 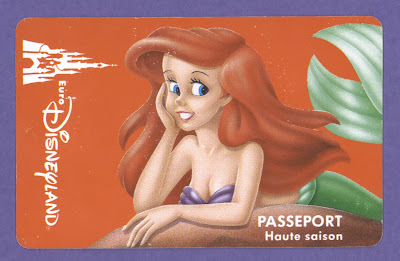 Following up on yesterday’s post, here is the back of the Euro Disneyland Passport. Westcot2000 asked if the passport had a date, possibly the date is August 31, 1993, but that’s just a guess from “310893”It seems much later than the opening in April 1992, maybe it was an expiration date? I was told this was from the first week or so the park was open. 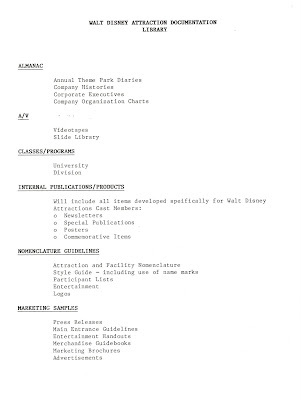 Also note it’s “Valid during ANY SEASON.” and the first three letters of the computer print are "MKP" Magic Kingdom Paris??? I'm confused, you? 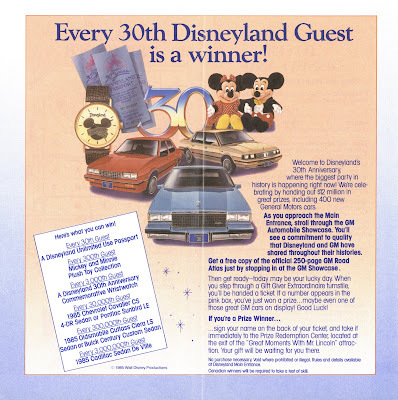 Both of the items in today’s post were given to me along with a TON of vintage Disneyland paper items spanning three decades; tickets, photos, magazines and lots, lots more. You know who you are out there so THANK YOU again for your amazing gifts, we’re all going to be enjoying them. 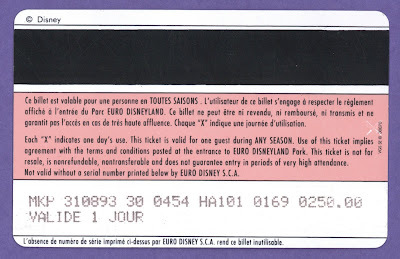 Time for a post on a subject I know nothing about... Euro Disneyland. 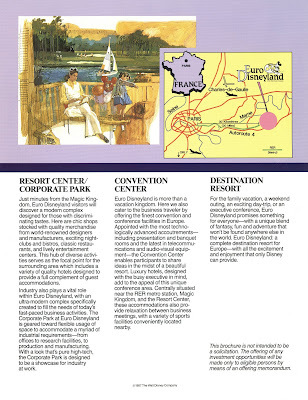 Now called Disneyland Paris, this was the second Disney Theme Park built outside of the united states. This great glossy color brochure is a gem. 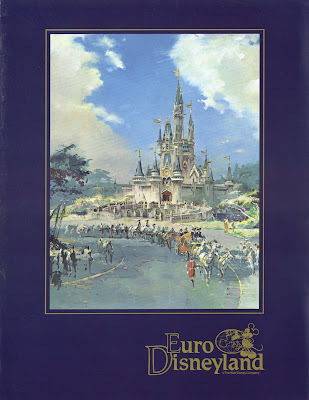 The artwork reminds me of the Walt Disney World concepts (cover art of the Castle look familiar?) 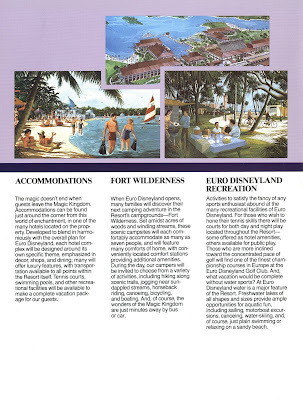 and the entire brochure looks to be copied from the Tokyo Disneyland pre-opening brochure (link). Hey, I like that map! 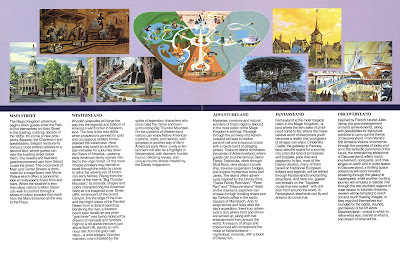 Isn't that concept art on the right (Tomorrowland-ish) from Disneyland circa 1960's? This place looks pretty similar to Disneyland Anaheim, maybe I better visit France! I want one copy of everything in this library! Jason at Disneyland Nomenclature might find the "Nomenclature Guidelines" of some interest, I sure would! 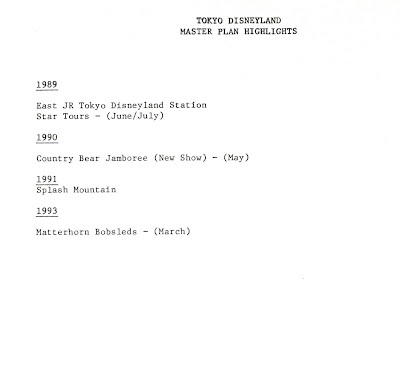 There are a few pages that talk about Tokyo Disneyland, this is the second page of the "coming attractions" to Tokyo Disneyland. "Matterhorn Bobsleds" March 1993. I don't think that ever happened did it? Toyko Magic might know. This blank envelope came with the package, I have no idea why. 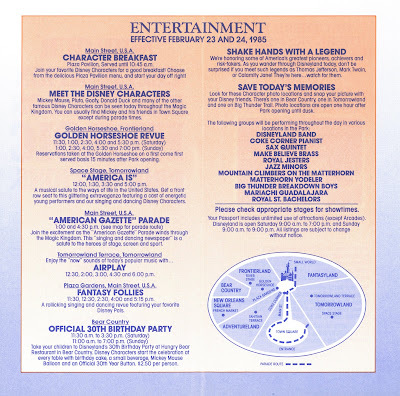 A Celebration of Heroic Proportions February 23 & 24, 1985. Wow, that's a pretty strong statement! I guess giving away a couple of cars every DAY is a big deal, even if most of them were Chevy Cavaliers! 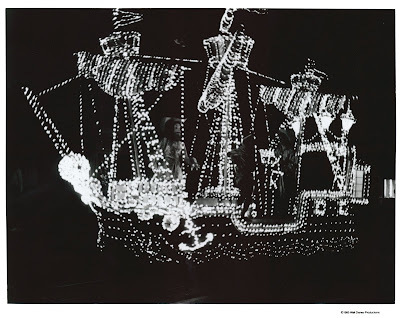 Here's a weird press photo of the Captain Hooks ship in the Main Street Electrical Parade. Black and White photos at night seem kind of lame for what they are trying to convey here. Yes the photo looks just as bad in person. Welcome to Magazine Monday. For today’s feature let’s set the way back machine as far as it goes here on the blog. 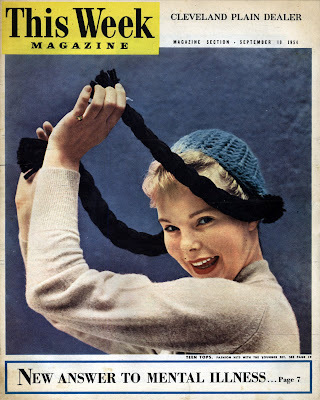 From September 19, 1954 it’s “This Week Magazine”. This large format “Newspaper” magazine is from the “Cleveland Plain Dealer”. “Teen Tops. Fashion hits with the younger set” you’ll see more about that later. The mental illness article was a real downer with its talk of lobotomies so you won’t see more of that later. 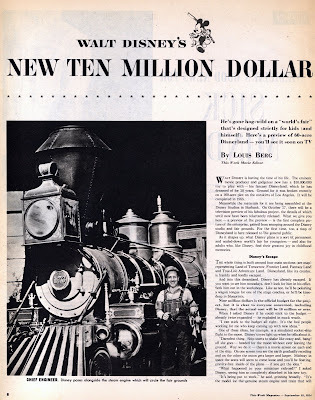 “Walt Disney’s New Ten Million Dollar Toy”. 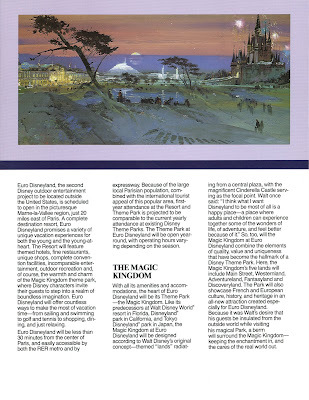 These old article sure made a big deal about how much the park was going to cost and they were usually wrong! What train is that??? Parts of the train resemble the C.K. Holiday (link) but the number is wrong and it seems larger? Plus wasn't the C.K. Holiday built from scratch? 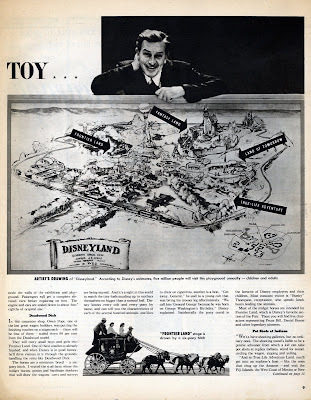 Throughout the entire article Disneyland is referred to as a “Fair”. I wonder what Walt’s thoughts on that were? “Sardinian Donkeys” and “Midget Horses”, sounds more like a Circus! “Pot Shots at Indians”, that is NOT the way the shooting gallery ended up. Did someone ask the Sardinian donkey if they wanted to wear that costume? 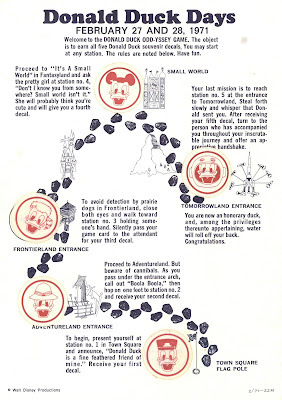 Fascinating information on the “Adventures of Alice in Wonderland” attraction. Poor Land of Tomorrow, getting the short end of the stick in 1954 just like 2009!!!! Not much else in this issue except advertisements and this great Agatha Christie story “Murder at the Vicarage”. 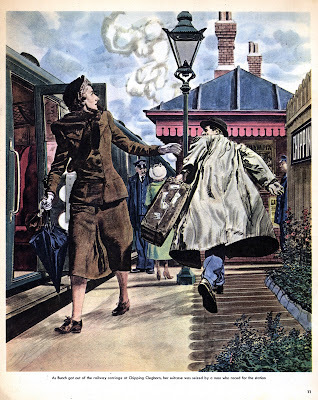 I like the full page illustration by Robert Fawcett. Speaking of advertisements, here we go. 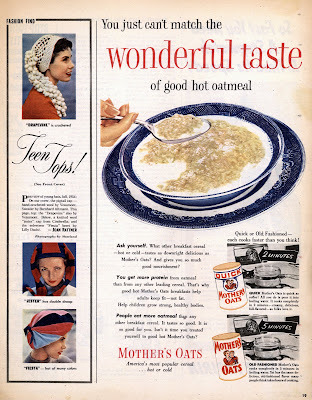 It’s the 1950’s, so you gotta have Oatmeal! On the left are some more “Teen Tops", I like the “Jester” with its double droop. 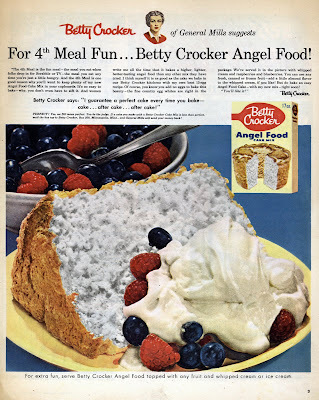 “For 4th Meal Fun”! Only in the 1950’s was dessert considered a meal! 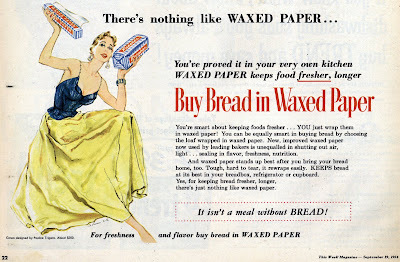 "Waxed paper keeps food fresher, longer." “It isn’t a meal without BREAD!” so there. Ok ladies, time for house work while wearing your Sunday finest. 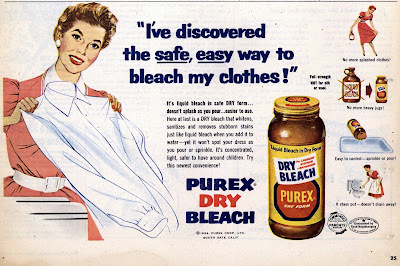 Do laundry the “safe, easy way” with “Purex Dry Bleach”. Hey that looks pretty handy, I’m going to have to find myself a jar of that stuff. 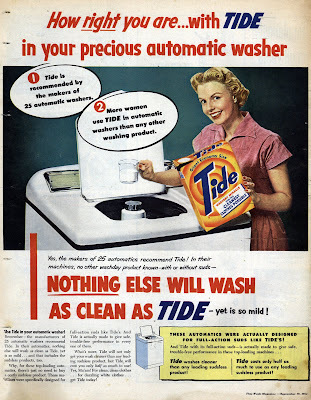 “Nothing else will wash as clean as TIDE yet is so mild!” I hope Larry Tate paid Darrin Stephens top dollar for that slogan! 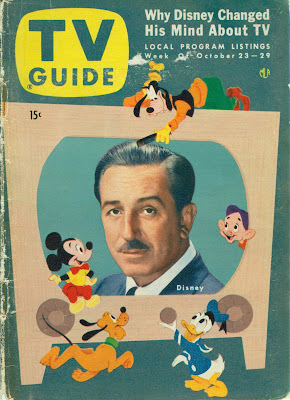 Since we are in 1954 and in case you missed my two prior 1954 Magazine posts, here are the links to both.